The city of Dover is a major town and is an important ferry port which is found in the home county of Kent. This city is found in the South East England and faces the Strait of Dover. This city is home to the Dover Calais ferry across the Port of Dover. The city is made more prominent by the chalk cliffs known as the White Cliffs of Dover. 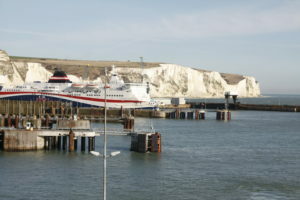 Tourism is a major source of income for the city and in the past there were numerous forms of ferry services related to the Port of Dover. Recorded history shows that the city derives its name from the word Portus Dubris, derived from the name Brythonic for waters. The same name is present in the French form (Douvres) and Modern Welsh (Dofr). The city is interesting for its travellers as there are many archaeological findings which shows that there were stone age people in the area. Further, there are some Iron Age finds as well. In the past during the Roman period, the city was part of the Roman communication network. The city was connected through road to Canterbury and Watling street becoming Portus Dubris, which was a fortified port. The city has a lighthouse built in the Roman era which is the tallest structure done by the Romans in Britain and also the remains of a villa during the Roman period with a well preserved painting, the only one outside of Italy. The city also has a mention in the Domesday Book. There were forts which were built above the port and the lighthouses were made to give guidance to passing ships. The port is quite famous with Cinque Ports and has been used during Napoleonic Wars and the Second World War. 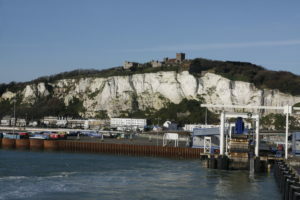 Dover has an oceanic climate and the climatic conditions are quite similar to that of the rest of the United Kingdom with mild temperatures all year round and low rainfall. A lowest temperature of -8 C has been recorded and a highest temperature of 31 C. However, general temperatures vary between 3 C and 21.1 C.